A $1 trillion federal spending bill signed into law last week includes $144.5 million to fund 149 contract air-traffic control towers at regional airports across the nation, including the Hagerstown Regional Airport, according to U.S. Sen. Barbara A. Mikulski. The funding through the Consolidated and Further Continuing Appropriations Act of 2015 — which also benefits nearby Frederick Municipal Airport and three other Maryland regional airports — ensures that the air-traffic control towers will stay open at least through Sept. 30, 2015. Mikulski said in a news release that the funding for federal contract air-traffic control towers is "good news" for jobs and communities in Western Maryland, as well as other areas served by smaller regional airports. "In recent years, these contract towers and their communities have faced shutdown, furloughs and uncertainty," she said. "... I will keep fighting to ensure the continued operation of our regional airports, making our nation safer and our economy stronger." The U.S. Department of Transportation announced plans last year to close 149 federal air-traffic control towers across the nation due to the sequester, but Congress passed legislation giving the Federal Aviation Administration the flexibility to shift funding to prevent furloughs of air-traffic controllers and keep the contract towers open. "We appreciate Sen. Mikulski’s unwavering support of the airport and the support for the businesses that call the airport home," said Phil Ridenour, director of the Hagerstown Regional Airport. "We would also like to thank Sen. (Ben) Cardin and Congressman (John) Delaney for all their efforts to keep Western Maryland’s premier travel hub on the map. We look forward to continuing expansion of air travel options," he said. The county-owned airport off Showalter Road north of Hagerstown is home to two commercial air-service providers, Allegiant Air and Sun Air, the latter offering commuter service to and from Dulles International Airport near Washington, D.C.
Allegiant Air recently announced it would be adding twice-weekly flights to the Tampa Bay, Fla., area, starting in February. The airline currently flies from Hagerstown to Orlando. Currently, 10 full-time county employees work at the airport, as well as 13 part-timers, according to county officials. On the private side, approximately 1,300 people work at businesses on or near the airport, contributing about $109 million to the local economy, officials said. Mamakos was eventually booked, fingerprinted and had her mug hot taken before she was sent to the county jail. Her bags and her shocked friends went on to Alaska. The trial of the Guyanese pilot on board whose plane US$620,000 in cash was found in Puerto Rico is set for February 23rd next year. According to court documents seen by Stabroek News, District Judge, Jay A Garcia-Gregory, today gave the scheduling orders for the trial along in Puerto Rico with the expected procedures for the trial. 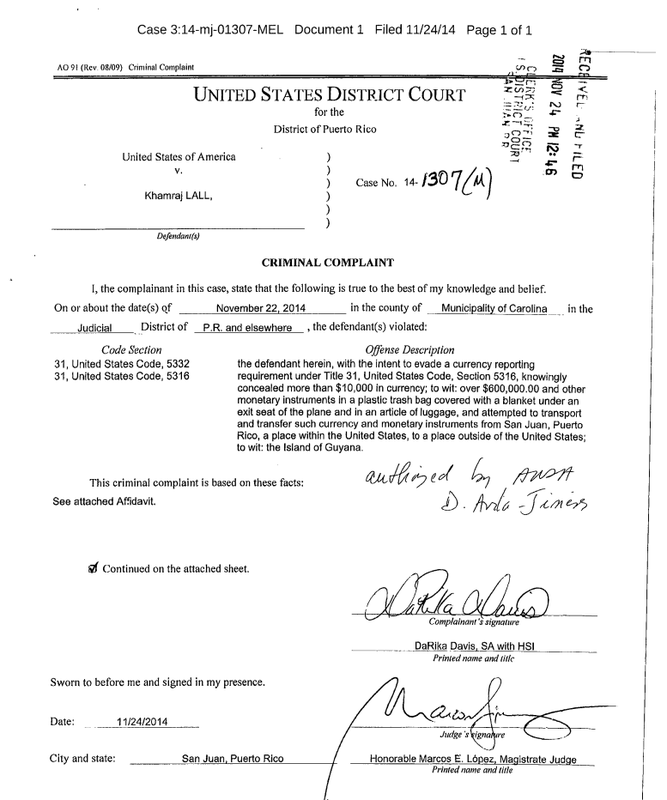 According to the document, a pre-trial date is also set for February 17th 2015 at 3pm ADT and Lall, the operator of an executive jet service, has up to February 13th to file a motion to change his plea of not guilty. The judge’s orders also state that government should make available to Lall all discoverable material before January 5th. Documents relied upon by the plaintiff of government witnesses who will testify at the trial should also be available to Lall’s legal team three days before the trial. If the government does not file designated evidence to be used at the trial by January 5th it cannot use or refer to same during the trial unless the order is amended. Further the Judge states that any pretrial motions, including motions to suppress, shall not be filed later than January 19th 2015 as the court will not consider it after the deadline. Also, a proposed voir dire and proposed jury instructions are to be filed two days before the trial and the US government is also required to submit to the court, in writing, the elements of the offence pertaining to the case. 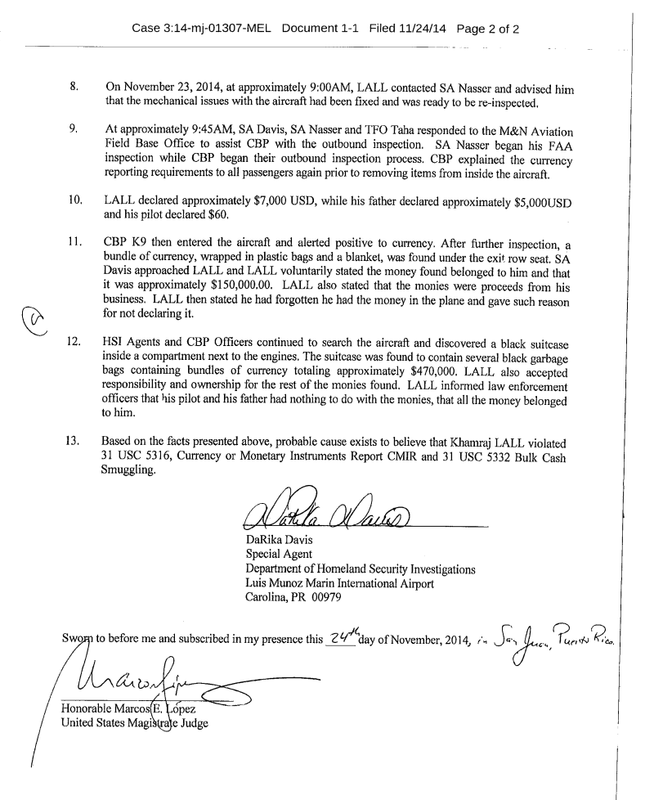 According to the grand jury indictment which was seen by Stabroek News, Lall is charged with bulk cash smuggling. It is alleged that with the intent to evade a currency reporting requirement, he knowingly concealed more than US$10,000 in currency and other monetary instruments and transported and transferred and attempted to transport and transfer such currency and monetary instruments from a place in the US, that is, Puerto Rico, to a place outside the US, that is, Guyana, in violation of United States Code 5332(a) (1) and (2). In addition to the charge of bulk cash smuggling, Lall also faces forfeiture of property not limited to the cash, according to the indictment. 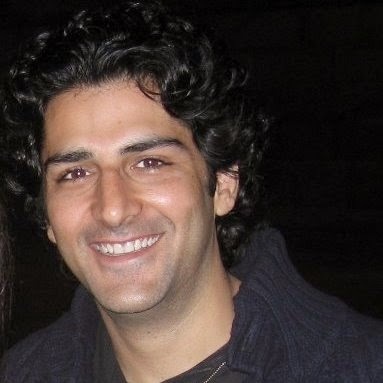 The grand jury indictment says that Lall shall, upon conviction, forfeit to the United States all property, real and personal, involved in the offence, and all property traceable to such property, wherever located, and in whatever name held, which includes but is not limited to the currency found aboard the jet. 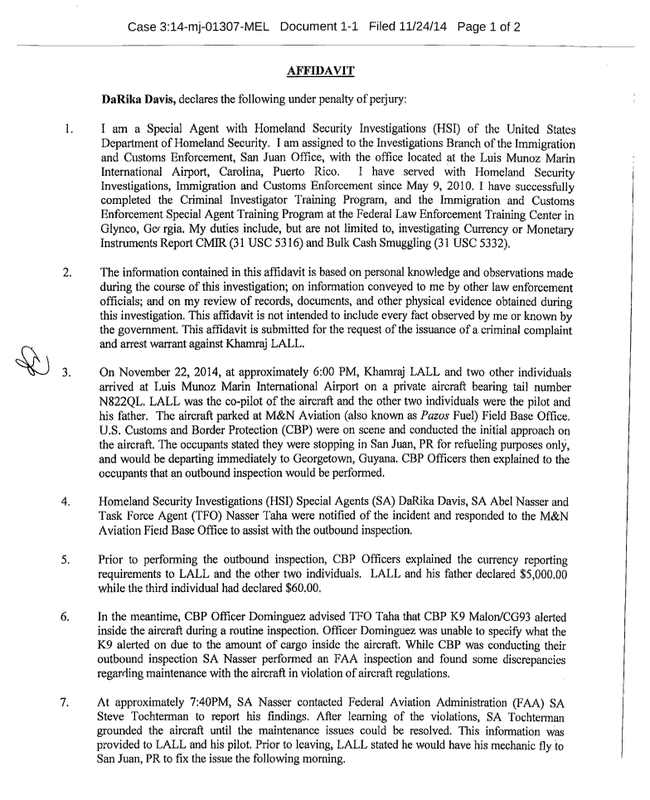 Searches of Lall’s private aircraft during a refueling stop at the Luis Munoz International Airport, in San Juan, on November 22, uncovered US$150,000, wrapped in plastic bags and a blanket under the exit row seat and US$470,000 in a black suitcase inside a compartment next to the engines, which contained several black garbage bags containing bundles of currency. Lall, authorities said, accepted responsibility and ownership for the money and informed that his co-pilot and his father, who were with him during the refueling stop, had nothing to do with the cash. 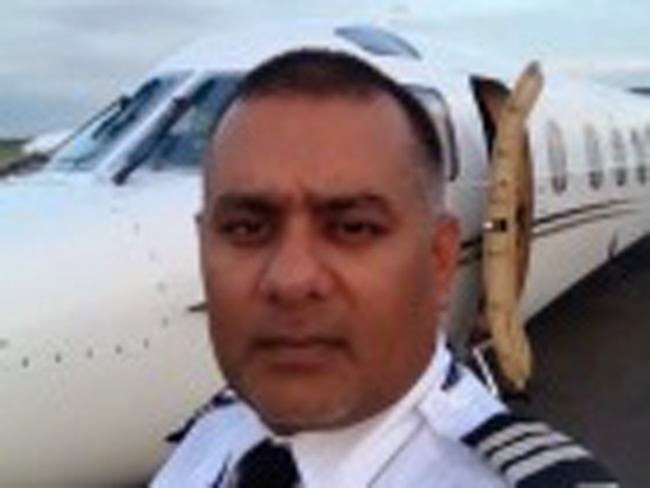 Lall, in addition to his private jet service, is the owner of Kaylee’s Service Station, at Coverden, East Bank Demerara, which he purchased in 2007 as part of his investment plans in Guyana. According to the Exec Jet Club website, he later expanded his venture when he introduced Quin’s Special Events & Services, a limousine service. His arrest has attracted much attention here particularly following the disclosure that President Donald Ramotar flew on the service thrice. Heeding the long standing demand of private aviation operators, the state government has revised usage charges for the Jakkur airstrip. The tourism and infrastructure department, which is in charge of the Government Flying Training School (GFTS) at Jakkur, has significantly reduced rentals and parking charges. However, landing charges considered to be "through the roof" remain the same, much to the chagrin of operators. 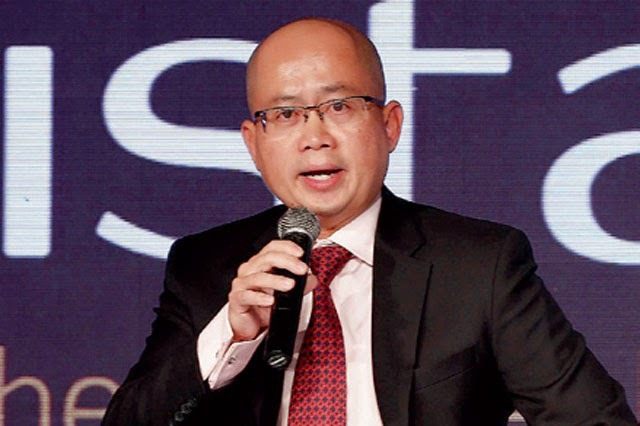 "The government has rationalized the fees following operators' request. While the parking charges and rentals have been revised, there is no change in the landing charg es," Aerodrome operations manager A N Vishwanatha told Bangalore Mirror. According to the flying school's authorities, the government has maintained the landing charges at Rs 3,000 per landing for single engine non microlite aircraft, and Rs 200 per landing for microlites, much higher than the two other airports in the city. The parking charges for microlites have been increased from Rs 3.15 per hour to Rs 10; non-microlite aircraft can park at Rs 50 per hour, a neat 50 per cent reduction from the earlier Rs 100 per hour. The rentals - fee for space taken in hangars to park the aircraft - have been reduced from Rs 1,000 per square metre per year to Rs 605 per square metre per year. Some of the private operators operating out of Benga luru such as Deccan Charters, Jupiter Aviation Services, Agni Aerosports use the space in Jakkur aerodrome to park their aircraft. However, the revision has not gone down too well with the aviation operators who feel the new fee rates are still way too high. Compared to KIA and HAL airports, the fees levied by Jakkur airstrip are considered the costliest. According to Julian Dsouza, associate vice president of Jupiter Aviation Services, what Jakkur airstrip is charging is still much higher than the other airports in the country which have better facilities. "In Bengaluru, three airports charge three different rates, which is quite ridiculous. We have been pleading with the state government to bring down the fees. Why will Ipay Rs 3,000 at Jakkur as landing fees where there are no facilities when I can land at the international airport by paying Rs 1,300 and at HAL by paying Rs 1,000 per landing?" said DSouza, whose company has 10,000 feet space in Jakkur hangars to park two aircraft. Compared to the revised parking charge which is Rs 50 per hour for a single engine, non-microlite aircraft, HAL airport charges are still low at Rs 30 per hour. Operators feel that the state government is not keeping in tune with the baseline prices charged by other airports in the country and has fixed the fees arbitrarily. "If I get my aircraft for servicing and park at Jakkur for a week, I would end up paying around Rs 17,000 and now with the revised fee, it will be around Rs 9,000. It is still a big deal for small operators and does not make economic sense to use the Jakkur airstrip," said another aviation company honcho. Some damage control exercise has been carried out on a portion of the 22-km elevated expressway built adjacent to the airstrip which was considered a safety threat for flying operations. At a height of about 40 feet, the elevated road falls on the landing path and was perceived as a threat for small planes like Cessna used for flying classes. After the flying operations were suspended, a technical committee comprising aviation experts that was constituted to review the issue had suggested painting the obstacle red. "Fifty metres on both sides of the flyover that faces the runway has been painted red, making it easy for the pilots to identify the obstacle. We were pushing for this measure since two years and now it has been done,'' says Vishwanatha, who was formerly with international airport ATC. LONG BEACH >> Corralling a group of Cub Scouts on a tour through the Long Beach Airport may have been a challenge for some, but Elliott Schwartz handled the curious bunch with aplomb. On a rainy, cold Wednesday afternoon, the 62-year-old Long Beach resident kept the children’s interest with tidbits of the airport’s history, including how the 1941 bombing of Pearl Harbor delayed the opening of the airport terminal, or how aviation pioneer Calbraith Rodgers made his way from New York to Long Beach in 1911. “(Rodgers) had no lights, no GPS; he followed the railroad tracks,” Schwartz told the scouts. For more than a dozen hours a week for the last three years, Schwartz brings to life the history of the Long Beach Airport as one of the lead tour guides. He is one of 28 locals who are part of the Volunteer Tour and Ambassador Program. Guided tours of the historic Long Beach Airport Terminal are offered for free as part of the airport’s Public Affairs programs. Volunteer tour guides, who include private pilots, teachers, executives and airport employees, donate their time to familiarize the public with Daugherty Field’s rich aviation history. It’s quite a compliment bestowed on Schwartz, who didn’t know much about the city’s aviation history when he first arrived in Long Beach in 1980. Schwartz, who is married with a grown son, has also volunteered with the Scouts and Rancho Los Alamitos, where his wife Cheryl also volunteers. Interested in becoming a volunteer at Long Beach Airport? Visit lgb.org for more. 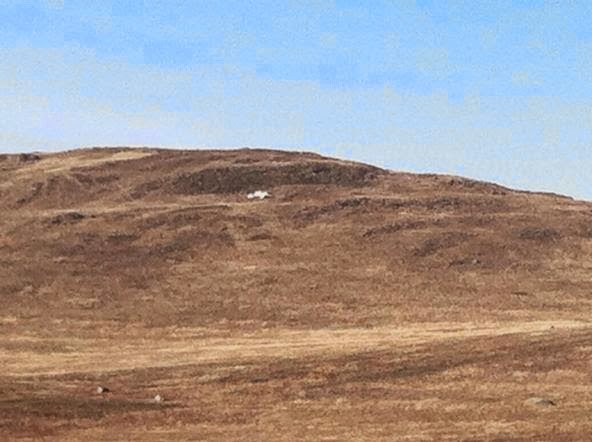 On December 16, 2014, about 1615 mountain standard time, a Piper PA-18-150 Super Cub, N5989Z, impacted a hill while maneuvering in Ronan, Montana. The rear-seated passenger was operating the airplane under the provisions of Title 14 Code of Federal Regulations Part 91. The front-seated commercial pilot was fatally injured and the passenger sustained serious injuries; the airplane sustained substantial damage. The local personal flight departed Ronan Airport, Ronan, Montana about 1600. Daytime visual meteorological conditions prevailed and no flight plan had been filed. The passenger was a student pilot and had purchased the airplane September 30, 2014. He had recently purchased a new propeller for the airplane and the pilot, who was additionally a Federal Aviation Administration (FAA) certificated mechanic, installed the propeller just prior to the accident flight. Numerous witnesses reported observing the airplane maneuvering at a low altitude a few minutes prior to the accident. One witness recalled hearing the airplane's engine accelerate and rev higher just prior to the impact. Another witness stated that he observed the airplane perform several erratic maneuvers where it was low to the ground and would rapidly climb and descend similar to an agricultural operation (crop dusting). 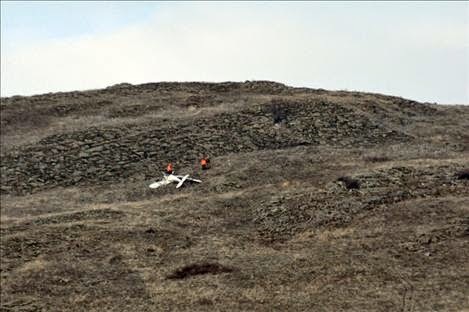 The airplane wreckage was located on a steep hillside slope about 100 feet below the peak. The accident site was about 5 nautical miles (nm) from Ronan Airport on a bearing of about 295 degrees. The wreckage came to rest on a hillside in the Valley View Hills, which is the most easterly elevated terrain from the valley where both the towns of Pablo and Ronan are located. The surrounding area was sparsely populated. There were ground scar signatures in the terrain, consistent with the propeller and left wing tip colliding with terrain at the initial impact. These first identified impact points were about 75 feet from the main wreckage on a bearing of 015 degrees and located on a 45-degree slope. The airplane's wreckage was found inverted with the nose headed upslope. KALISPELL - The lone survivor of a plane crash west of Pablo last week has been flown to Seattle Harborview Medical Center where doctors are working to treat his serious injuries. Staff at Harborview tell MTN News that Ronan resident Tim Schaus remains in stable, but serious condition and has numerous broken bones and a compressed spine. Lake County Sheriff's Office spokesperson Karen Sergeant says the plane wreckage was removed from the hillside on Friday and taken to Missoula, where the National Transportation Safety Board continues to investigate the crash. It could be up to a year before any information is released by the NTSB as to why the aircraft went down. KANEOHE, OAHU (HawaiiNewsNow) - A World War II mystery is solved. Plane wreckage found off the Windward Oahu coast has been identified 69 years after it crashed. Chances are the families involved don't even know about the discovery. The World War II wreckage was found near the island known as Chinaman's Hat. It's sitting about 90 feet deep. "It's quite a sight. It's beautiful there. There are lots of fish," said Ron Tubbs, the scuba diver that made the discovery. Tubbs took pictures and video of the site. At first the engine and propeller were spotted. Then the steering wheel trim tabs and cockpit floor. "Everything matches and at that point it was pretty confirmed it was a PBM," said Steve Price, Hawaii Undersea Research Lab. "This is the engine and you can see the 18 cylinders." Hawaii Undersea Research Lab technician Steve Price also went to check out the wreckage. They were able to trace records and parts and concluded the plane is a PBM sea plane. They were even able to find the plane's crash report. Back on January 23, 1945 with Lt. TJ Connolly in the pilot's seat the plane crashed shortly after takeoff. An engine was leaking fuel. "He went forward. It got worse. They finally lost power and just dropped out of the sky," said Price. Eight people were killed. Six survived, including the pilot. "I'm sure that most of the family members of those who died or served on this aircraft during World War II are unaware of its being found," said Tubbs. They did contact the Joint POW/MIA Accounting Command, the organization that searches for unaccounted Americans. 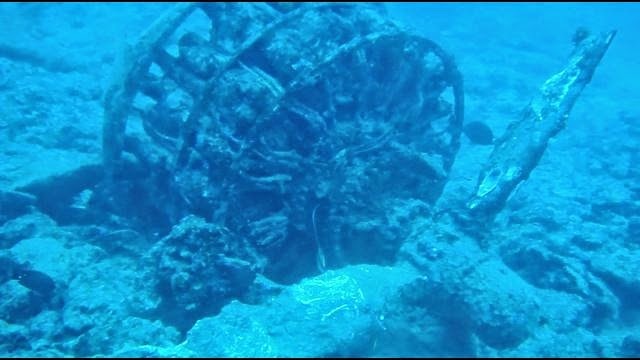 That's one of the reasons they think it's important to research the wrecks and there are hundreds around Hawaii. Although funding for the Hawaii Undersea Research Lab is drying up because of budget cuts. "This is a very important part of Hawaii's history and very important part of what happened in World War II," said Tubbs. The wreckage will stay in the ocean. It is protected and divers are not supposed to remove anything from the site. The airline is 49 percent owned by Singapore Airlines, one of the world’s top-rated carriers. Mumbai-based Tata conglomerate, one of India’s best-respected brands, controls 51 percent. Acadiana Regional Airport was able to accommodate a pretty large cargo aircraft Monday afternoon, 203,000 pounds to be exact. A Russian-manufactured Ilyushin Il-76D plane made its first stop in Iberia Parish when it landed with 120,000 pounds of outsized survey equipment. 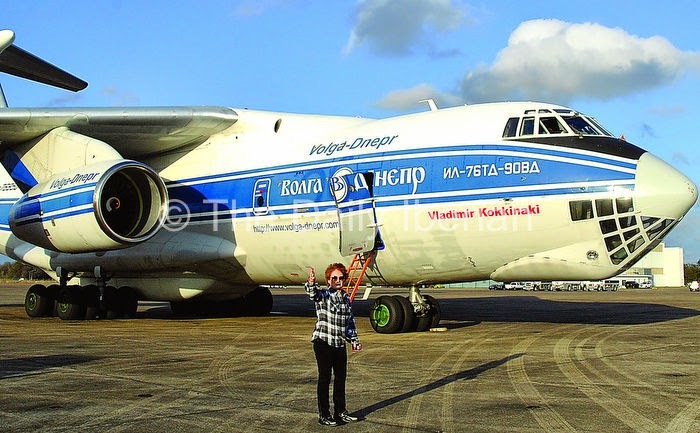 ARA was chosen because of the size of the plane, operated by Volga Dnepr Airlines, and its cargo. The big plane arrived at ARA around 4 p.m. to a crowd of about 20 to 30 onlookers. The aircraft, a white and blue four-engine 203,000-pound monster that dwarfed other private jets in the area, was loaded shortly after arriving and was scheduled to leave this morning at 9 a.m. The aircraft was delivering for Fugro GeoSurfaces Inc., a marine geophysics and seafloor mapping company, based out of Lafayette. In the near future, Devillier said the airport will continue to make improvements to the concrete construction of the runway, taxiways and tarmac at ARA. Doing so could allow for more aircrafts to choose ARA as a potential destination, he said. The ARA will have updated taxiway lights, runway lights and complete joint sealing of concrete slabs on the runway, which is close to $3 million in improvement, Devillier said. Michele Wilkinson, president and founder of Tailwind International Air Charters, said her company consulted with ARA to bring the aircraft to Iberia Parish. Tailwind International Air Charters is based in Addison, Texas. ARA wasn’t the first choice, however. Wilkinson also spoke with Lafayette Regional Airport officials, she said, but there were concerns about that airport’s capability to handle the size of the aircraft. Wilkinson said the ARA’s successful accommodation of the Il-76D by ARA could open the door for future business with the airport. “Our concerns were, first — could the airport handle it? Were they big enough and long enough? And because they have an 8,000-foot runway we figured they could handle it,” Wilkinson said. Michele Wilkinson, Tailwind International president and founder, gestures Monday while standing in front of a huge cargo plane at ARA. The huge plane collected cargo here and flew this morning to Singapore. This is quite possibly the most awesome gift you can give this holiday season. It's a flight on a private jet for you and your family or friends. JetSmarter, which calls itself the "uber of private jets," will offer the free flights on Christmas Day and New Year's Eve to anyone who downloads the JetSmarter app. The company said about 100 planes total will be available and flights will be given away on a first-come, first-served basis. Flights will appear on the app as soon as they become available, most typically one day in advance but sometimes as far in advance as three days, though no flights have been given out yet. Bottom line: Start opening and re-opening that app. Alternatively, a user can also sign up for push notifications for preferred destinations. You don't get to go anywhere you want. 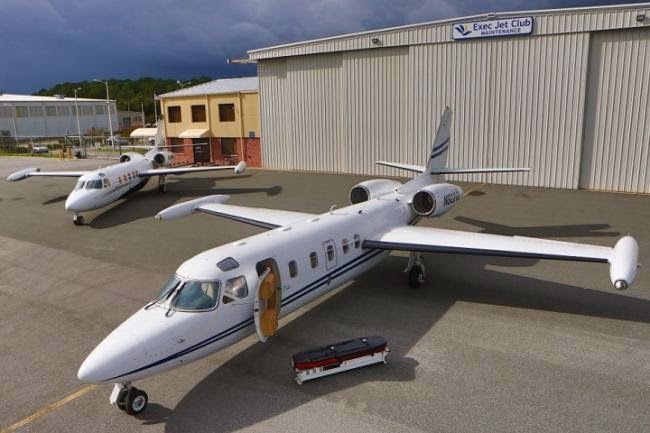 The company is looking to fill "empty leg" flights, or when an aircraft needs to reposition itself for its next customer or to return to its home base. For example, an aircraft may be in Miami, Florida but needs to get to New York City for a flight taking off. Common itineraries include: Los Angeles to Las Vegas, Miami to New York, New York to Boston, San Francisco to Los Angeles and Washington D.C. to New York. There's also the problem of getting home. More than likely, you'll have to book a commercial flight to do so, and that will cost you money. But hey, if you treat your friends and family to a free flight on your private-jet-for-the-day, maybe they can pick up the tab. There's a wild new theory about the disappearance of Malaysia Airlines Flight 370. It's from a former airline executive, who also happens to be a novelist. The theory is that the U.S. Navy shot down the plane to prevent a 9/11-like terrorist attack. Marc Dugain, an author and former CEO of a now-defunct French regional airline, told a radio station and French magazine Paris Match that he thinks the plane might have been downed near a U.S. military base on an island in the Indian Ocean after the plane's systems were hacked. The Daily Mail reports that Dugain cited a fisherman near the island of Diego Garcia, where the U.S. operates a large naval base, who said he saw what looked like a Malaysia Airlines plane on March 8, the day the jet disappeared. Other residents on the Maldives islands reported similar sightings around the time the plane disappeared. Dugain also said islanders found an empty fire extinguisher from the missing jet washed up on shore, but this report has not been confirmed, according to The Independent. Dugain theorizes that hackers took control of the plane remotely and steered it off of its planned flight path and toward the U.S. military base for an attack, leading the military to shoot it down. He said a fire on board the plane (which would explain the empty extinguisher) could have forced the crew to shut down their devices and stop electronic communication to control towers and radar. 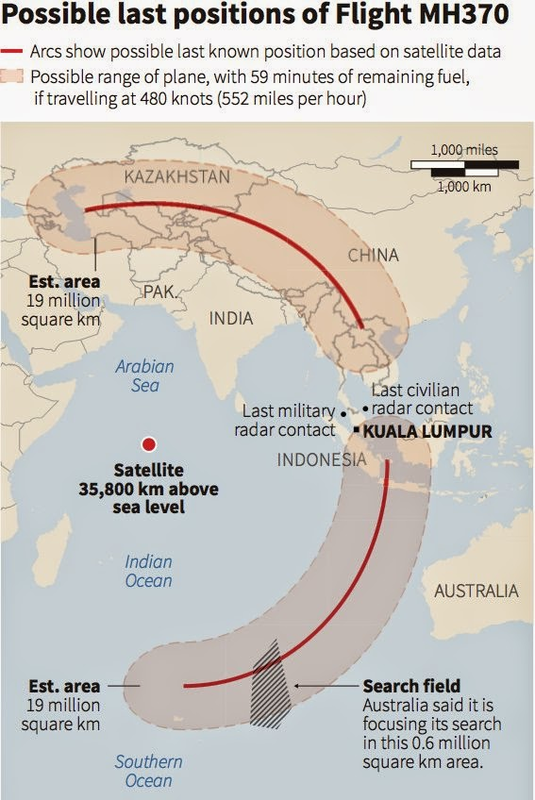 The disappearance of MH 370 is one of the most bizarre and tragic aviation mysteries of all time. This isn't the first time that someone from within the aviation community has aired theories about what happened. In October, Emirates airline CEO Sir Tim Clark told German newspaper Der Spiegel and the Sydney Morning Herald that the lack of wreckage from the plane and the pings the jet reportedly sent out over the Indian Ocean seemed suspicious and that he thought information was being withheld, according to News.com.au and the Daily Mail. While aviation industry officials have warned of the possibility of cyber criminal and terrorists taking control of airplane systems through hacking, Dugain's theory seems to be rooted more in conspiracy ideas than any solid evidence. The U.S. government has denied that the plane flew anywhere near the military base in question, and experts have mapped the plane's pings to place it in the southern Indian Ocean before it vanished, not the central part where the base is located. Search parties have repeatedly failed to bring forth any wreckage from the missing plane, which vanished with 239 people on board. Investigators have not offered any conclusive explanation as to what happened to the plane after it vanished from radar. NELSON, B.C. - The British Columbia government and a fuel-service company are facing allegations under the Fisheries Act in a rare prosecution launched by a member of the public. A provincial court judge approved the charges filed by Marilyn Burgoon, a Kootenay, B.C., resident, over a massive jet fuel spill in July 2013 that caused environmental devastation when a truck spilled its load into a creek in the province's southeast. Judge Mayland McKimm ruled there was enough evidence to lay charges against both the province and Executive Flight Centre Fuel Services Ltd., after 30,000 litres of jet fuel was discharged into a fish-bearing creek. It means a summons will be issued for both parties and a court hearing will be set. The charge under the Fisheries Act says in an offence to deposits a deleterious substance in water frequented by fish. Burgoon, whose legal effort was supported by West Coast Environmental's dispute resolution fund, said getting the charges laid was important for democracy and the fish and habitat in the Slocan Valley. "This provincial court decision means that government and industry are still accountable for their actions in a court of law. Even when government and industry drag their feet to avoid investigation of environmental offences, justice can still prevail," Burgoon said in a statement. Executive Flight Centre Fuel Services Ltd. was hired by the province to deliver fuel to fire-fighting helicopters in the Slocan Valley. Its truck overturned on a service road, spilling the fuel directly into Lemon Creek. During a hearing in Nelson, B.C., on Nov. 27, the court heard that the day before the accident a different fuel truck was given the wrong directions and also went up the Lemon Creek forest service road in an attempt to find the helicopter staging area. The court heard that the driver was able to get his truck out of the area and he told others when he arrived at the staging area that he was given incorrect directions. Burgoon alleged that the province was responsible for signage and directing traffic to the staging area. "The allegation is that the signage was incorrect and that error was compounded by a failure to correct the signage prior to the accident on July 26," McKimm's ruling said. "Essentially it's alleged the province knew or ought to have known that tanker trucks containing enormous quantities of jet fuel were being misdirected." A spokesman with the B.C. Environment Ministry said it would be inappropriate to offer comment while the case is before the courts. Wayne Smook, the chief operating officer of the Calgary-based Executive Flight Centre, would not comment on the allegations before the court, but said the cleanup of the area is progressing. He said the latest tests on water showed no contamination. "Obviously the remediation that we did worked very well," he said. Smook said they're still doing testing on fish populations and micro organisms in the creek and hope to have final test results in by early next year. "We obviously apologize for the spill, it was a situation where we responded to one event when we created another." The spill prompted a brief evacuation alert for nearby residents and a weeks-long do-not-use water order for residents along Lemon Creek and the Slocan River. 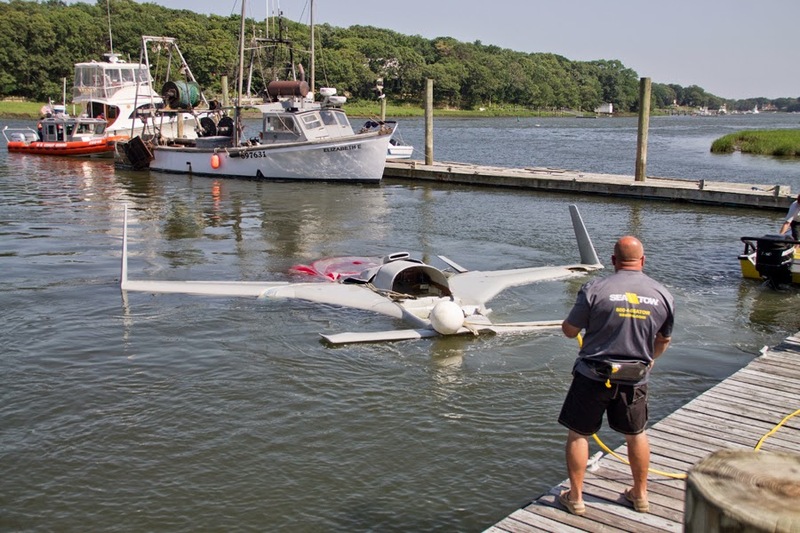 On July 6, 2014, about 1905 eastern daylight time, an experimental amateur-built Raven, N79ZR, was substantially damaged when it impacted the water in the vicinity of Mattituck, New York. The private pilot was fatally injured. The airplane was registered to and operated by an individual under the provisions of 14 Code of Federal Regulations Part 91 as a personal flight. Visual meteorological conditions prevailed and no flight plan had been filed. The personal flight originated at Brookhaven Airport (HWV), Shirley, New York, about 1855. The airplane was located floating on top of the water of Long Island Sound, the following morning by a private individual. According to radar data, the airplane was first observed at 1,200 feet above mean sea level (msl) south of HWV. The airplane turned left towards the north and continued to climb to about 8,500 feet msl as it went over the north shoreline and continued flight over Long Island Sound. The airplane subsequently began to descend. At 1904:18, radar data indicated that the airplane was at 7,400 feet msl and began a left 270° turn towards the east. At 1904:33, radar data indicated that the airplane was traveling in an east direction and was at 5,800 feet msl. The last radar return was recorded at 1905:19, and indicated an altitude of about 1,100 feet msl. The pilot, age 41, held a private pilot certificate for airplane single-engine land issued June 21, 2005, and a third-class airman medical certificate issued June 11, 2013, with no limitations. The pilot's logbook was not recovered for examination. On the pilot's June 11, 2013, Federal Aviation Administration (FAA) medical application, he reported 220 total flight hours. According to a statement provided by a flight instructor, the pilot had satisfactorily completed a flight review on April 6, 2014; however, at the time of the flight review, the pilot's total flight time was not recorded. 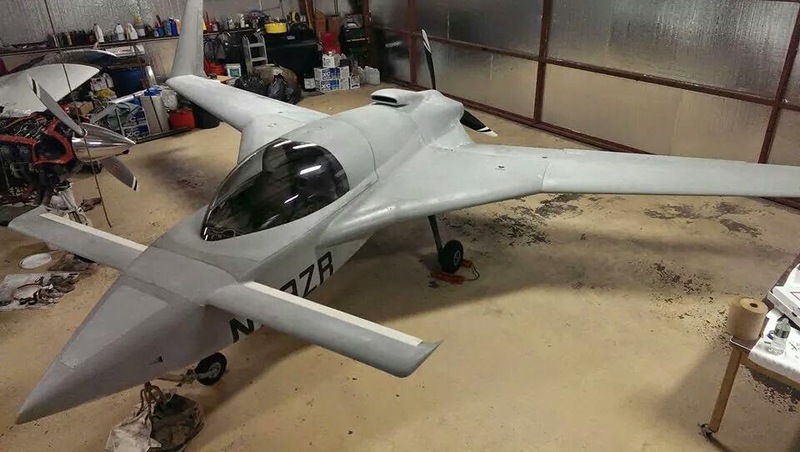 The four-seat, composite canard airplane, with retractable landing gear was manufactured in 2014 and issued an airworthiness certificate on February 7, 2014. It was powered by a Lycoming IO-540-C1A engine driving a Catto Glass Carbon Composite 3-Blade propeller. Review of the aircraft maintenance logbook records showed that a condition inspection was completed on February 7, 2014 at a recorded time of 20.1 hours. The Hobbs meter was not located at the accident site and airframe operating time could not be conclusively determined. The airplane was equipped with a front-hinged canopy which functioned as the front windshield, side windows, and cabin roof. The canopy was the only access to and from the cockpit. A primary latch lever mounted in the cockpit operated four latch pins. Weight and balance information, computed on January 30, 2013, indicated that the airplane's maximum gross takeoff weight was 2,200 pounds and the designed center of gravity (CG) range was 95 to 99.5 inches aft of datum. Utilizing the computed information, the airplane's weight at the time of takeoff was about 1,818 pounds and the CG was 102.2 inches aft of datum. The investigation was not able to determine if the pilot had performed a weight and balance or why he elected to operate the airplane out of CG. The 1853 recorded weather observation at Westhampton Beach, The Gabreski Airport (KFOK), Westhampton Beach, New York, located about 10 miles to the south of the last recorded radar return, included wind from 220 degrees at 9 knots with gusts of 17 knots, visibility 10 miles, clear skies, temperature 22 degrees C, dew point 17 degrees C, and barometric altimeter 29.98 inches of mercury. The wreckage was located at 41°3'53.7" N and 072°41.418" W, about 4 miles north of the north shore of Long Island and about 20 miles northeast of the departure airport. Examination of the airplane by an FAA inspector and a representative from the engine manufacturer revealed damage to fuselage, left wingtip leading edge, and the right canard trailing edge. The damage was consistent with a left wing low attitude when it impacted the water. The pilot had a personal parachute pack, and when recovered, photographic evidence revealed that the parachute had been deployed, remained attached to the pilot, trailing behind the airplane, and wrapped around the propeller. Examination of the canopy brackets attached to the fuselage and both hinges revealed no tearing or shearing of the bolts; however, neither the bolts nor the canopy were present. Flight control continuity was confirmed to all flight control surfaces from the cockpit control, except for the rudders. Rudder continuity was confirmed from the cable fracture point in the vicinity of the rudder pedals to the rudder control surfaces; however, the rudder pedals were absent. The left wing and left canard remained attached to the fuselage. The left wing exhibited leading edge damage which extended from the wingtip inward approximately 4 feet. The nose section exhibited impact damage and was partially fractured on the right side circumferentially around the bottom of the nose but remained partially attached on the left side. The nose wheel remained attached and was partially extended. Examination of the canopy brackets attached to the forward section of the fuselage and both hinges revealed no tearing or shearing of the bolts; however, no bolts nor the canopy were present. The canopy was subsequently located July 9, 2014, floating on top of the water, about 39 miles northeast of the last recorded radar return. The canopy remained intact and the windscreen was not damaged. A video camera remained attached to the canopy; however, no recording of the accident flight was able to be extracted from the camera memory. The canopy quick release mechanism remained attached to the canopy and was found in the released position. The four locking pins and associated locking pin holes exhibited no distortion and were unremarkable. The four pins were reinstalled into the locking pin holes and appeared to lock into place. The quick release line was pulled by an FAA inspector and all four pins released and operated normally. The instrument panel exhibited impact damage but remained attached to the forward portion of the cockpit. The throttle lever handle was impact separated; however, the lower portion of the throttle lever arm remained attached and was in the full forward or "OPEN" position. The mixture lever was in the full forward or full "rich" position. The fuel selector valve was in the "BOTH" position. The landing gear position indicator located aft of the fuel selector valve indicated three "UP" positions. Both ignition switches were found guarded and in the "ON" position. The glareshield included circuit breakers and several switches. The following switches were found in the on position: Master, Radio Master, Landing Light, Strobe Lights, Pitot Heat, Spare Circuit, and Fuel Pump. The left side control stick remained attached to the control column. The left and right cockpit molded seats remained attached and had various fractures located along the back. Both seatbelts and shoulder harnesses remained attached to the associated attach point; however, the right seat belt and should harness had been cut by first responders to facilitate recovery of the occupant. The right wing and right canard remained attached to the airplane. The right rudder remained attached to the winglet at all hinge points. The right aileron remained attached at all hinge points. Both fuel caps remained secured and in place. Each fuel tank indicated a 30 gallon capacity. The aft pusher engine compartment remained attached to the fuselage and the firewall was not damaged. The lower and upper engine cowlings exhibited impact damage but remained attached to the fuselage. The engine assembly remained attached to all engine mounts. The composite three-blade propeller remained attached to the propeller crankshaft flange. The propeller blades were not damaged, and the personal parachute canopy and associated cords were found wrapped around the blades and hub. Examination of the engine assembly revealed that the left and right engine exhaust pipes exhibited impact crush damage at the Nos. 1 and 2 cylinders. All induction tubes were attached to their respective attached points. The throttle cable remained attached to the throttle control arm on the fuel injector servo and was at mid-range. The mixture control remained attached to the mixture control arm and was in the full rich position. The fuel injector servo was removed and contained fuel. The fuel injector servo fuel inlet screen was removed and free of contaminants. The fuel injector servo regulator section was disassembled and no anomalies were noted. The fuel flow divider was removed, disassembled and no anomalies were noted. The fuel injector nozzles were removed from all cylinders and no anomalies were noted. The engine was subsequently partially disassembled. The engine was rotated by hand using the propeller. Suction and compression was obtained on all cylinders. Valve train continuity was observed through all cylinder rocker arms. The accessory drive gears were observed rotating. Crankshaft and valve train continuity was verified. A detailed "Memorandum of Record - Engine Examination Report" with accompanying pictures is contained in the public docket for this investigation. An autopsy was performed on the pilot on July 7, 2014, by Suffolk County Medical Examiner's Office, Hauppauge, New York. The autopsy reported the cause of death as "multiple blunt impact injuries," and the report listed the specific injuries. According to the FAA Aerospace Medical Research website, Tetrahydrocannabinol (THC) is the psychoactive compound found in marijuana and has effects at levels as low as 0.001 ug/ml. THC has mood altering effects causing euphoria, relaxed inhibitions, sense of well-being, disorientation, image distortion, and psychosis. The ability to concentrate and maintain attention are decreased during marijuana use. Tetrahydrocannabinol carboxylic acid is the inactive metabolite of tetrahydrocannabinol. A fuel receipt was located revealing that the airplane had been fueled at HWV, at 1837 on the day of the accident, with 53 gallons of fuel. The Airplane Flying Handbook (FAA-H-8083-3A) Chapter 15, which states in part, "…once the stall has developed and a large amount of lift has been lost, the airplane will begin to sink rapidly and this will be accompanied by a corresponding rapid increase in angle of attack. This is the beginning of what is termed a deep stall. As an airplane enters a deep stall, increasing drag reduces forward speed to well below normal stall speed. The sink rate may increase to many thousands of feet per minute. The airplane eventually stabilizes in a vertical descent…it must be emphasized that this situation can occur without an excessively nose-high pitch attitude…Deep stalls are virtually unrecoverable." Section 4 "Aerodynamics of Flight" states "The CG range is very important when it comes to stall recovery characteristics. If an aircraft is allowed to be operated outside of the CG, the pilot may have difficulty recovering from a stall. The most critical CG violation would occur when operating with a CG which exceeds the rear limit. In this situation, a pilot may not be able to generate sufficient force with the elevator to counteract the excess weight aft of the CG. With the ability to decrease the AOA [angle of attack], the aircraft continues in a stalled condition until it contacts the ground." The section further goes on and states the following: "Longitudinal stability is the quality that makes an aircraft stable about its lateral axis. It involves the pitching motion as the aircraft's nose moves up and down in flight. A longitudinally unstable aircraft has a tendency to dive or climb progressively into a very steep dive or climb, or even a stall. Thus, an aircraft with longitudinal instability becomes difficult and sometimes dangerous to fly. 3. Area or size of the tail surfaces"
The "Glossary" defines CG as "the point at which an airplane would balance if it were possible to suspend it at that point. It is the mass center of the airplane, or the theoretical point at which the entire weight of the airplane is assume to be concentrated. It may expressed in inches from the reference datum, or in percentage of mean aerodynamic chord (MAC). The location depends on the distribution of weight in the airplane." According to a book titled "The Light Airplane Pilot's Guide to Stall/Spin Awareness" a deep stall is "…when the horizontal tail of a conventional airplane becomes buried in the main wing's tail wake and loses its power to push the nose down, or with a canard design when the main wing stalls before the canard does. In both cases, the airplane seeks a higher angle of attack, usually above 40 degrees, and stabilizes there. There may not be enough elevator authority to reduce the angle of attack for recovery." According to Advisory Circular AC90-109 Section 5c(6) "It's also possible, even for a seemingly carefree handling airplane, to achieve what some have called a deep stall, where there is not sufficient nose-down pitch authority to break the stall, possibly creating an unrecoverable situation. 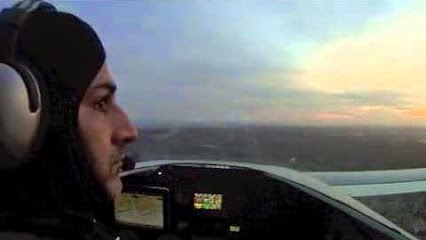 Some airplanes can pitch nose-up before the stall, resulting in a rapid stall entry unless the pilot counters with a conscious forward yoke/stick motion." Zubair Khan in 2006 with his brother-in-law Umar Niazi. 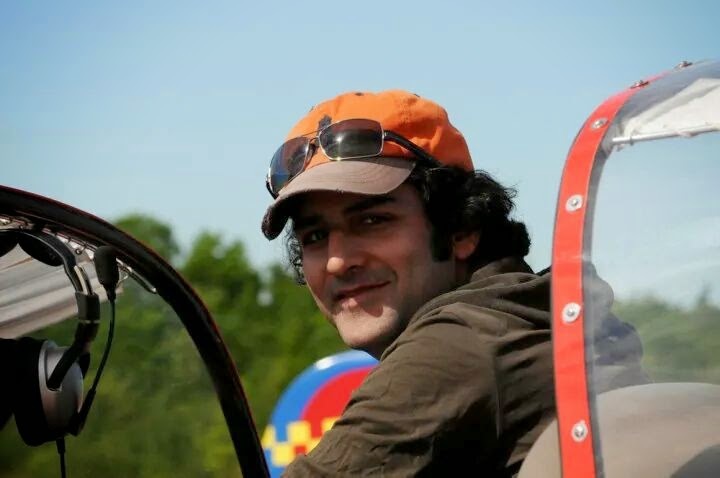 Mr. Khan was killed when his experimental plane crashed into the Long Island Sound near Mattituck. They were all doing something they loved. Zubair Khan, 41, had spent the past two years converting a twin-engine CoZy aircraft into one with a larger single engine — a task many thought he couldn’t complete. Mr. Khan, a native of Pakistan and a veteran of its navy, was a software engineer who lived in Manhattan’s West Village. The U.S. Coast Guard found his aircraft submerged in the water north of Mattituck the morning of July 7. He had flown from Brookhaven Calabro Airport the evening before. While a parachute had been deployed from the plane, Mr. Khan was found inside the aircraft, according to police. 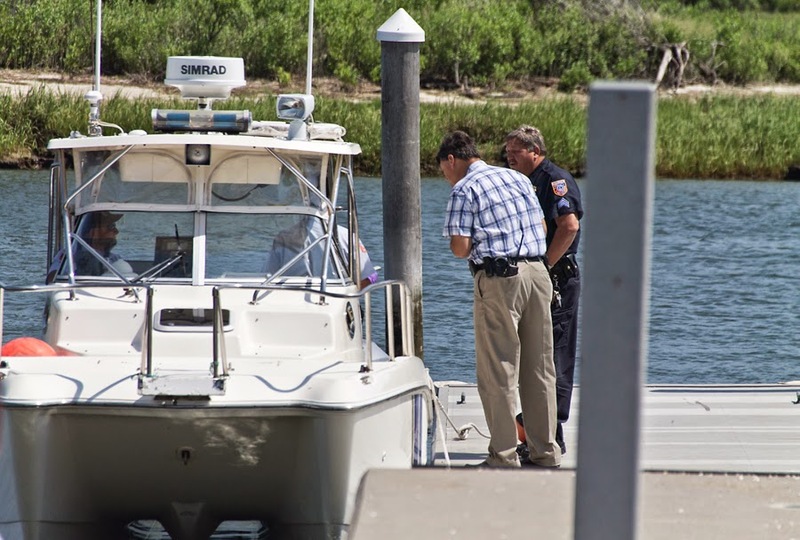 Two months earlier, on the morning of May 5, the Coast Guard recovered the body of a missing boater east of Mattituck Inlet. Ciro Stellges of Selden, 59, was found during a search that covered more than 400 square miles. The married father of four had called police a day earlier, saying his boat was taking on water three miles offshore. He had launched from Mattituck and was en route to Port Washington, operating a 26-foot fiberglass sailboat named MAC, police said. The third death happened farther east, in Cutchogue, where 66-year-old Carl Czajkowski of South Jamesport died while spearfishing Oct. 14. 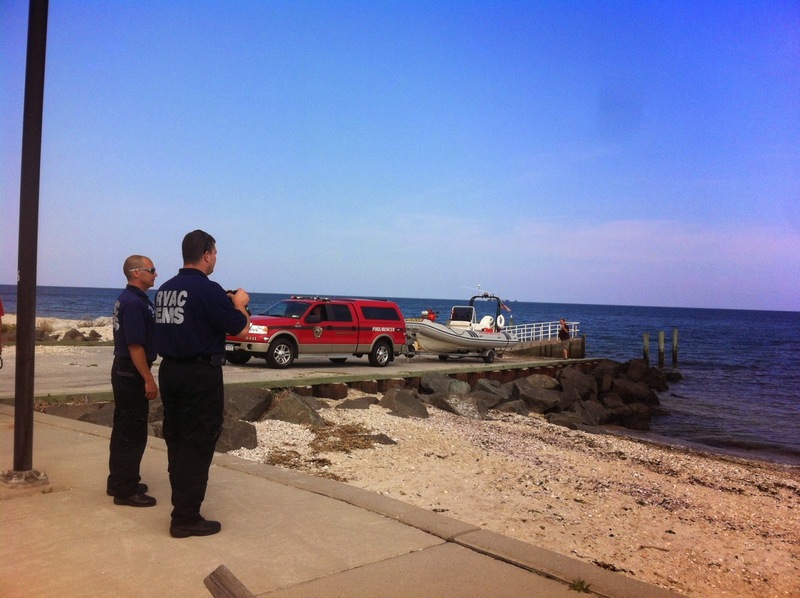 Police had received a report of a scuba diver who hadn’t returned and launched a search with the assistance of the Cutchogue Fire Department and Southold bay constables. Hours later, Mr. Czajkowski was found dead in the water. On July 6, 2014, about 1905 eastern daylight time, an experimental-amateur built Raven, N79ZR, impacted the water in the vicinity of Mattituck, New York. The certificated private pilot was fatally injured. 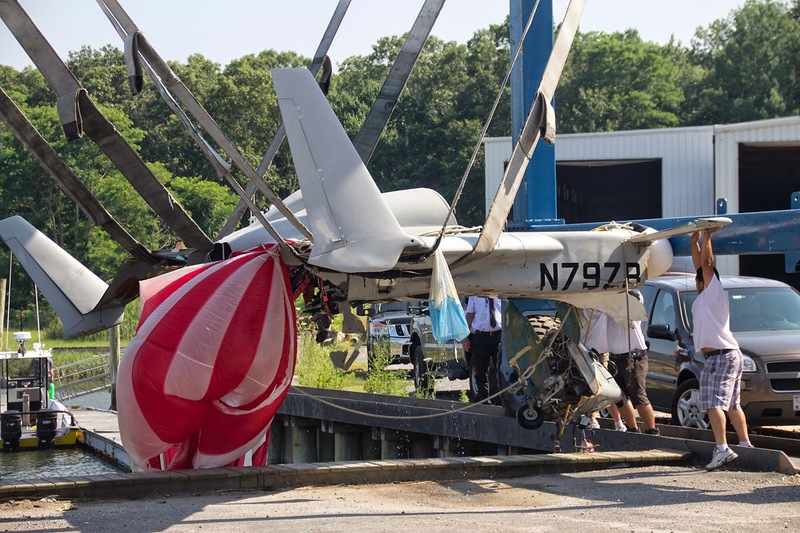 The airplane was located the following day floating in the Long Island Sound and sustained substantial damage to fuselage and nose section. The airplane was registered to and operated by an individual under the provisions of Title 14 Code of Federal Regulations Part 91 as a personal flight. Visual meteorological conditions prevailed and no flight plan had been filed. The flight originated from Brookhaven Airport (HWV), Shirley, New York, about 1855. According to radar data, the airplane was first observed at 1200 feet above mean sea level (msl) south of HWV. Then, about 1856, the airplane turned north and continued to climb to about 8500 feet msl as it went over the shoreline. About 1904, the airplane was at 7000 feet msl and began a left 270 degree turn to the east and descended during the turn to about 5800 feet msl. The last radar return was recorded about 1905 and indicated an altitude of about 1100 feet msl. 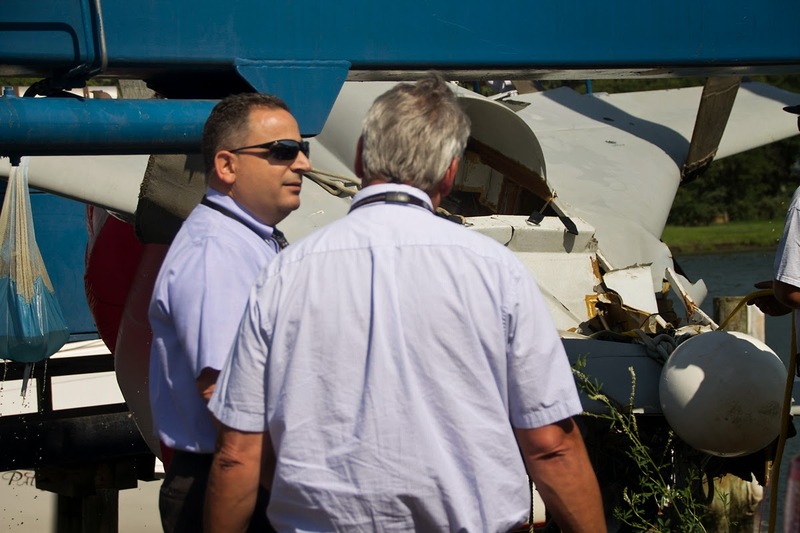 Examination of the airplane by a Federal Aviation Administration inspector and a representative from the engine manufacturer revealed damage to fuselage, left wingtip leading edge, and the right canard trailing edge. The pilot had a personal parachute pack, and when recovered, the parachute had been deployed, remained attached, and was found trailing behind the airplane. Examination of the canopy brackets attached to the fuselage and both hinges revealed no tearing or shearing of the bolts; however, no bolts nor the canopy were present. The canopy was subsequently located July 9, 2014, floating in the water, about 39 miles northeast of the last recorded radar return. 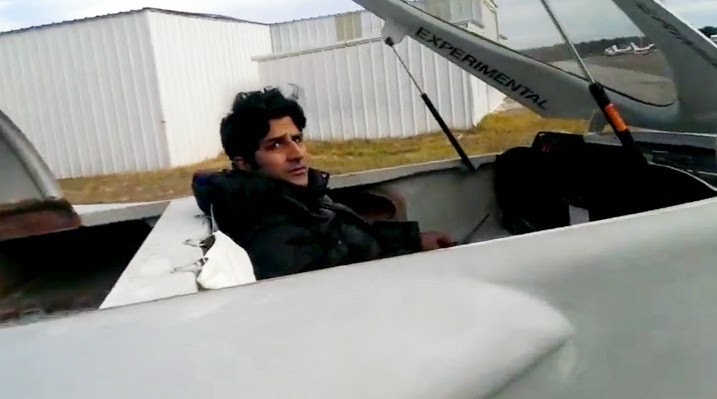 Zubair Khan during the first taxiing of his plane at Brookhaven Calabro Airport in February. Southold Town police sergeants confer with marine unit officers after they arrived in Mattituck with Mr. Khan's body on board. Riverhead ambulance volunteers wait as police and firefighters investigate reports that a plane crashed in Long Island Sound. Onlookers watch as Mr. Khan’s plane is towed to shore in Mattituck Inlet. 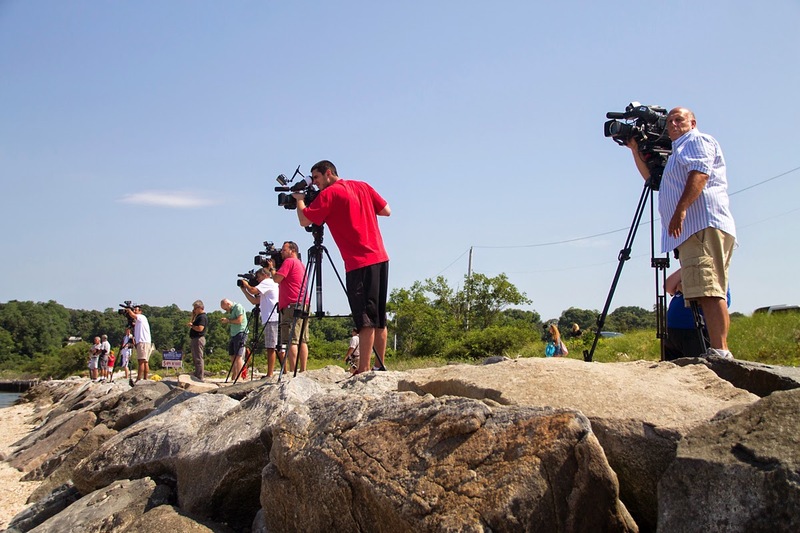 More than a dozen media outlets swarmed the Mattituck shore after the crash. 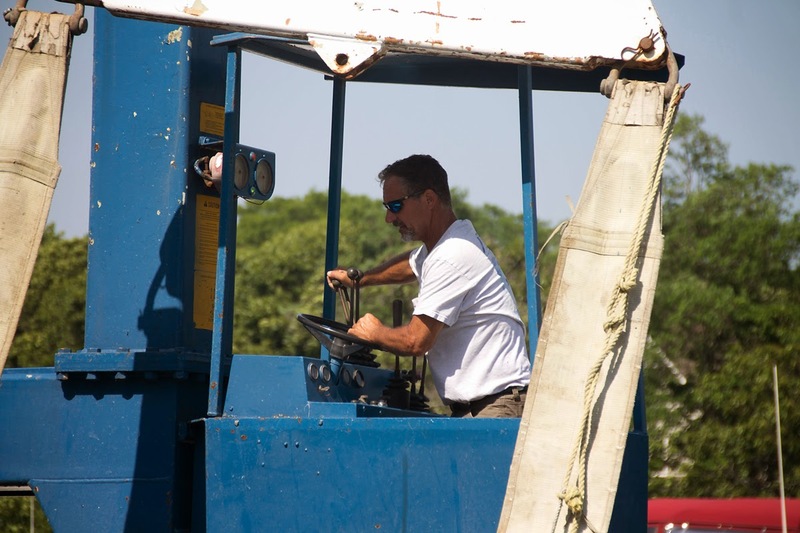 A Mattituck Inlet Marina employee operates the crane to lift Mr. Khan’s plane from the water. 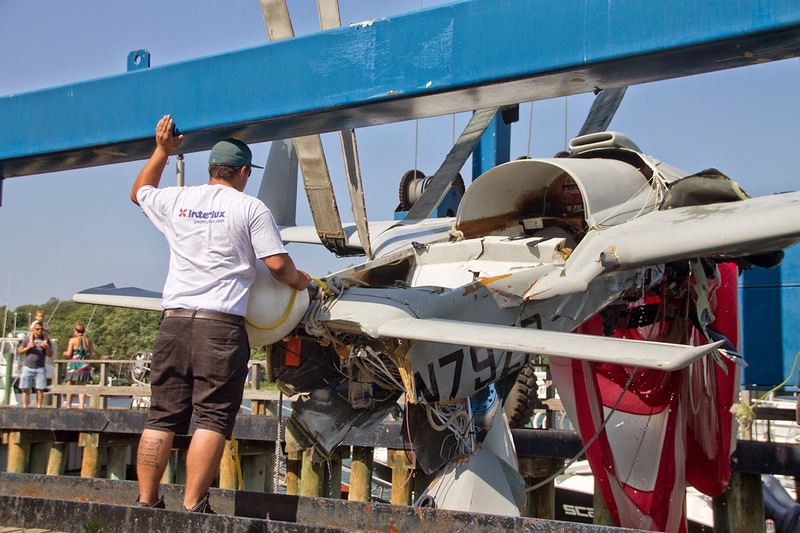 A Mattituck Inlet Marina employee helps guide the crashed experimental plane out of the water. The front of the plane’s fuselage was falling off as the plane was returned to land. 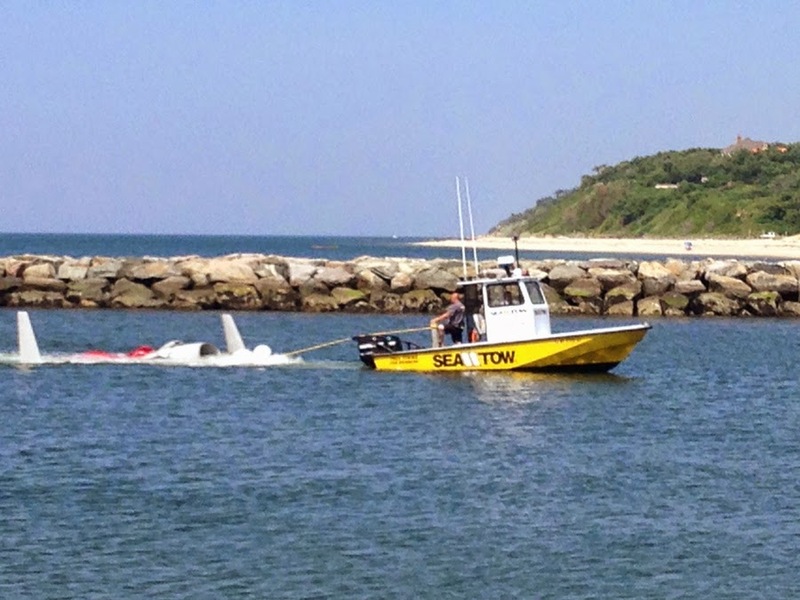 A Sea Tow worker helps pull the downed plane from the water at Mattituck Inlet Marina. Graveyard for jets coming to China's "Ice City"